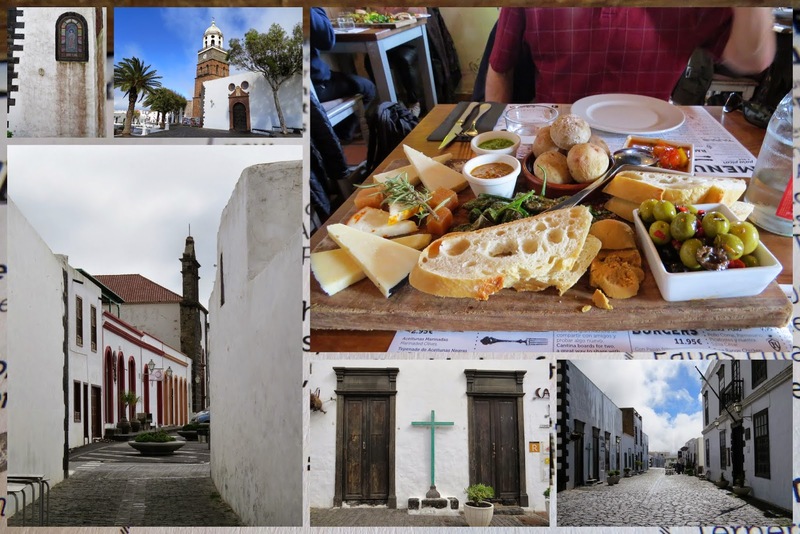 One of the things that impressed us the most about our 4-day trip to Lanzarote in January, one of the Canary Islands, was not the sun and beaches (it was actually cloudy and cool most of the time while we were there in January) but the food and wine. 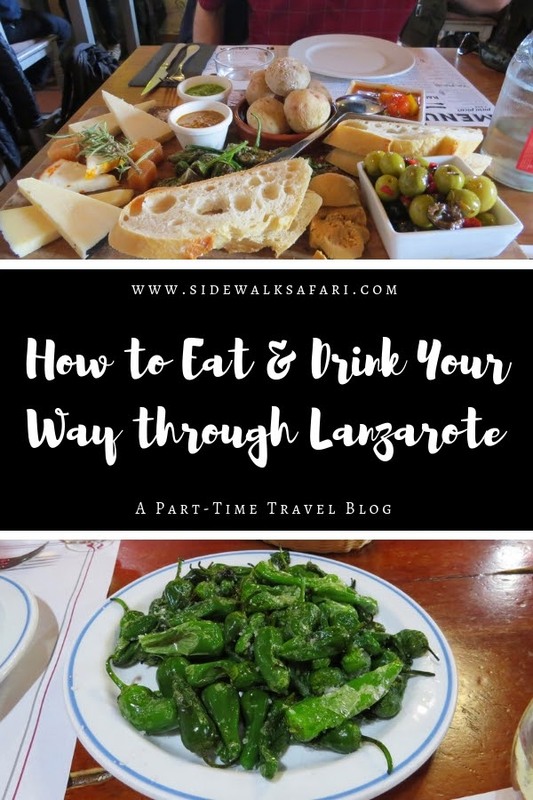 Here are ten of our best food and drink experiences during our four day getaway to the island of Lanzarote. 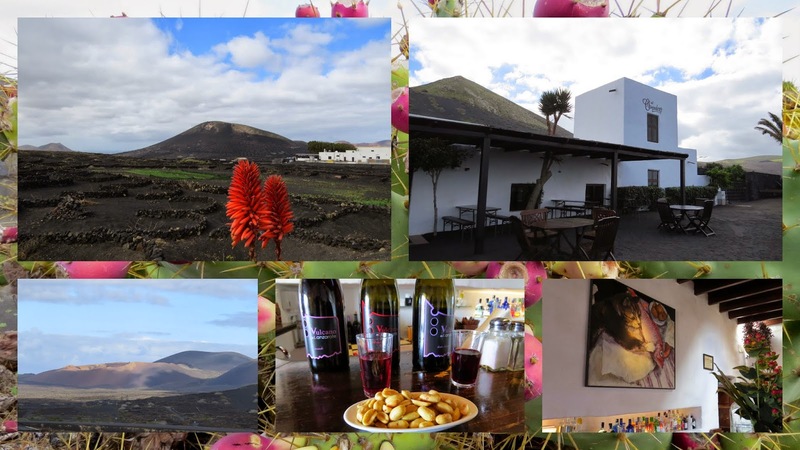 El Grifo was by far our favorite winery in Lanzarote. They do both a self-guided tour through a small museum and the vineyard itself plus a generous tasting is included in the admission price. 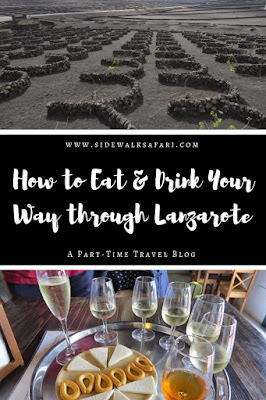 We particularly enjoyed the chance to see Lanzarote's unique vines; each dug into the black volcanic soil and lovingly protected from the wind by a semi-circle of rocks. The timing of our visit was also impeccable. We heard tinkling of the keys on a piano and walked into the small museum just as it started to rain outside. We were serenaded by someone prepping for an upcoming event as we explored the exhibits. 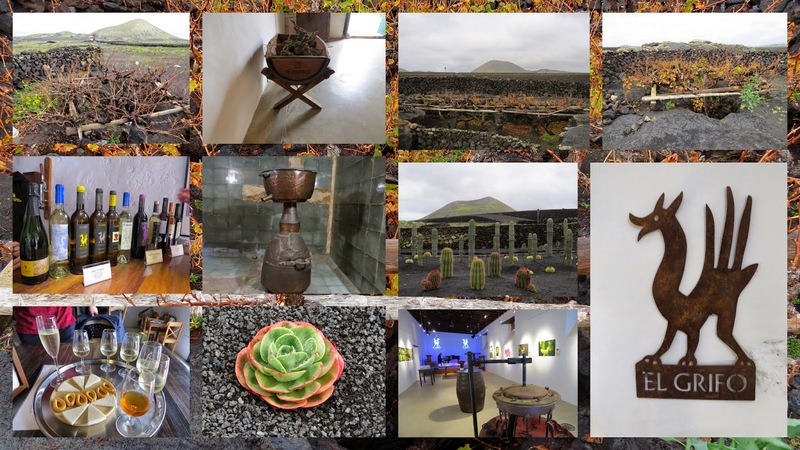 La Geria was another fun winery to visit on our journey to Lanzarote. Just look for the small white church that sits in front next to the road. Bottle after bottle of fine white and rose wines were lined up in the tasting room. We picked up some unique bottles of wine (some for less than 10 EUR each). This is wine we simply can't get at home. If you fly Ryanair or another low cost carrier to get to Lanzarote, it's worth paying for an extra checked bag so you can bring some bottles of wine home. Rubicon is just across the street from La Geria and features a small restaurant serving up local specialties. We enjoyed a flavorful octopus stew, chickpeas, and the famous Canarian wrinkled potatoes with two kinds of spicy mojo sauce. So delicious. We washed our Lanzarote cuisine down with a glass of Canarian wine, of course, before taking a quick tour of the grounds and tasting room. Bodega Suarez is a no-nonsense family run operation. We stopped here on a whim as we were driving past. The tasting room is carved out of space in what looks like a storage area for farm equipment. The wines themselves were good Lanzarote table wines and retail for 6-8 EUR per bottle. El Chupadero is situated among a vast expanse of vines with mountains in the distance. The views are simply stunning. 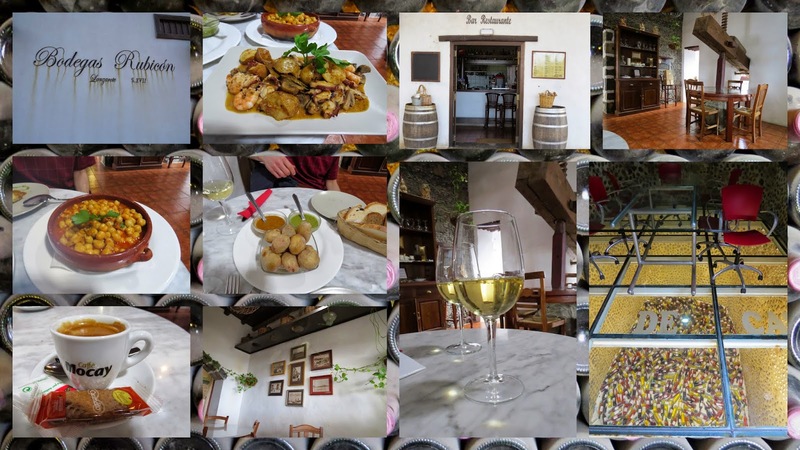 They do wine tastings by day and serve dinner and a bit of nightlife in the evenings. We sampled three of their Lanzoarote wines: a white, red, and rose. The tasting cost 1 EUR per sample but we were also served a generous bowl of peanuts at no charge which really hit the spot. We've lived in California and the one thing we miss living in Ireland is good Mexican food. 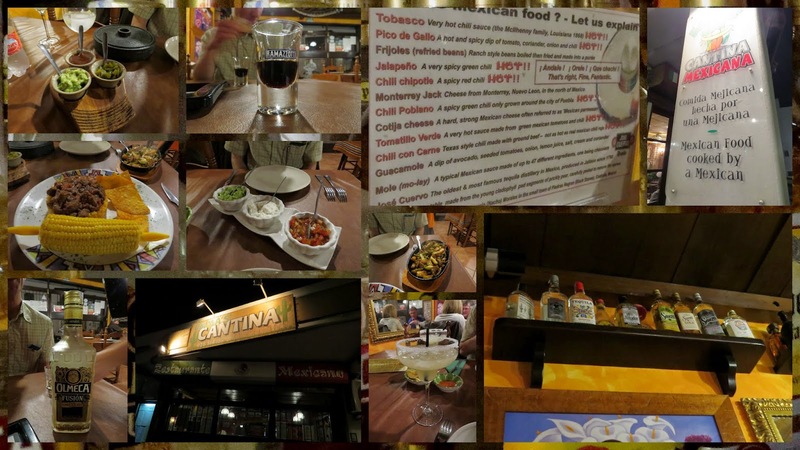 We jumped at the chance to try 'Mexican food cook by a Mexican' as advertised by Emma's Cantina Mexicana in Lanzarote. I loved how they had a decoder card on the table with stern warnings for those that can't take the heat. I tried the house special spicy chili con carne (they brought me a sample first to make sure I was up to the challenge since it's the spiciest thing on the menu - no problem!) washed down with a margarita. We were even treated to a little glass of Olmeca digestif afterward. Yum. We had dinner at an Italian place called Dolce Vita with sweeping views over the marina on a different night in town. Ravioli with cream sauce and bacon was a highlight of the meal. 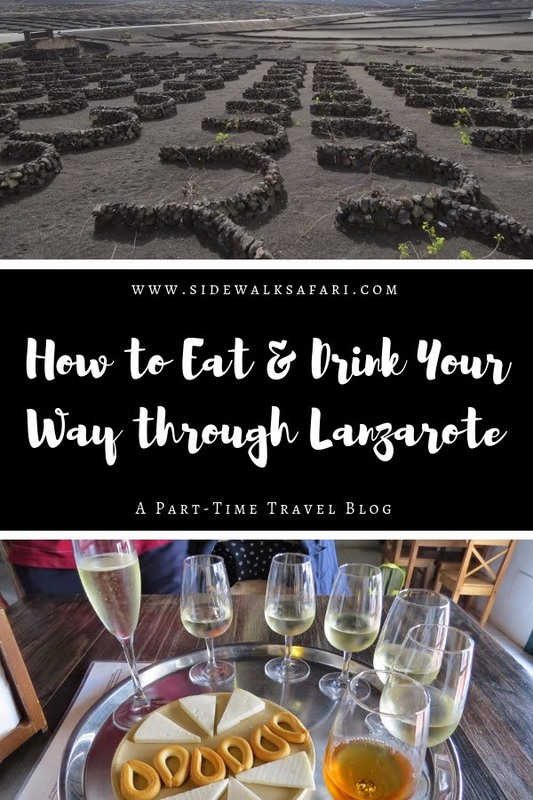 We sipped a bottle of local Lanzarote wine and at the end of the meal were treated to a digestif served over a giant ice cube. 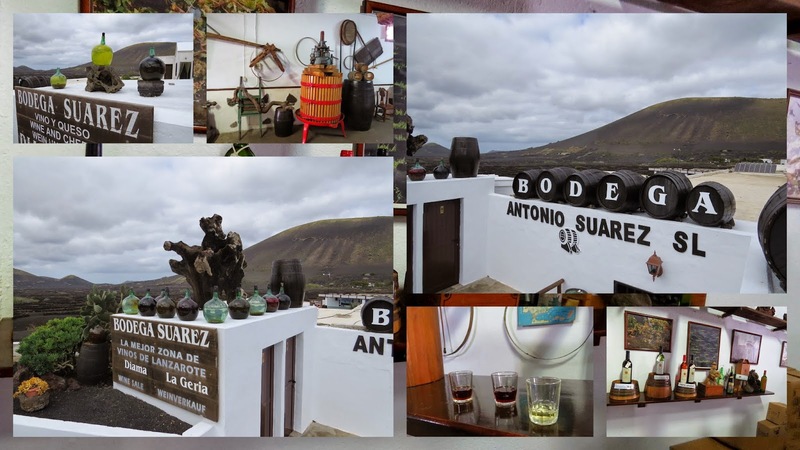 This was definitely a charming place and typified why we loved the food and wine in Lanzarote. Haria is a quiet white-washed town on the hillside in the middle of Lanzarote. 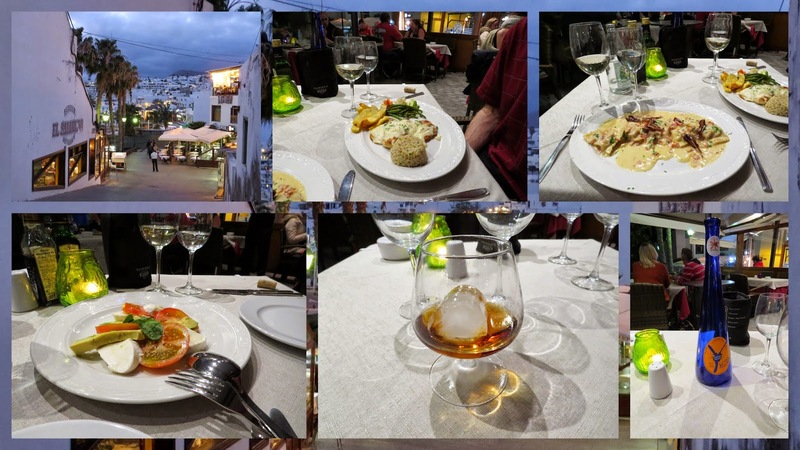 We had one of the best meals of our trip to the Canary Islands at La Sociedad on the main square. We were lured in by the attractive menu mounted on a paella pan. 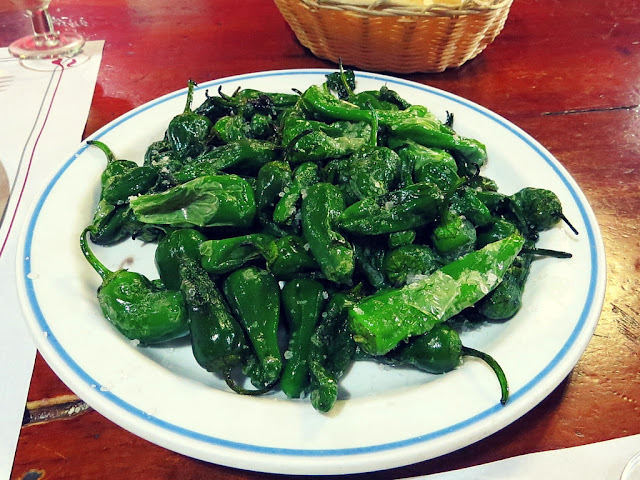 Our favorite part of this traditional Lanzarotan meal was the plate of small green peppers cooked in oil and coated with a generous layer of salt (pimientos padron). Delicious! 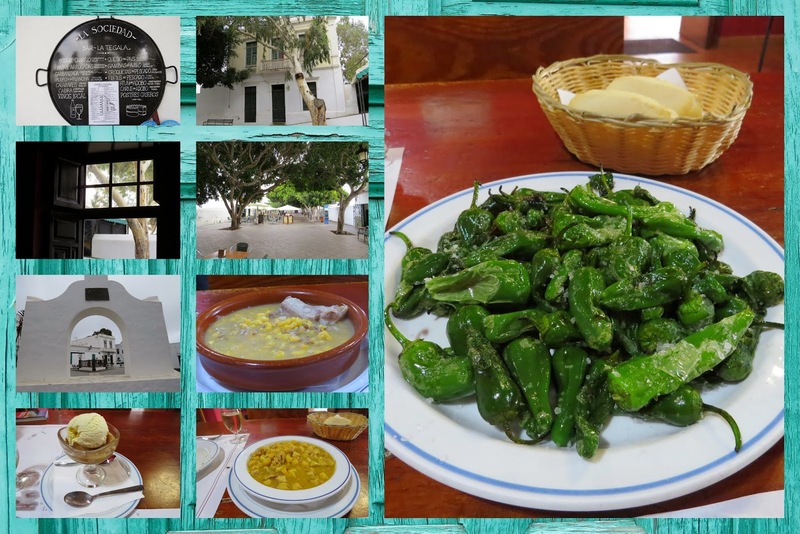 What's not to love about the cuisine of Lanzarote! Teguise was the former capital of Lanzarote from the 15th to 19th century. We stopped by on a quiet Sunday afternoon and after strolling through the streets lined with sun-soaked white buildings, we popped into La Cantina for lunch and sampled a platter of Canarian specialties including queso de Teguise, Potaje, arrugadas (wrinkled potatoes), gofio, mojos, pimientos padron and bread. 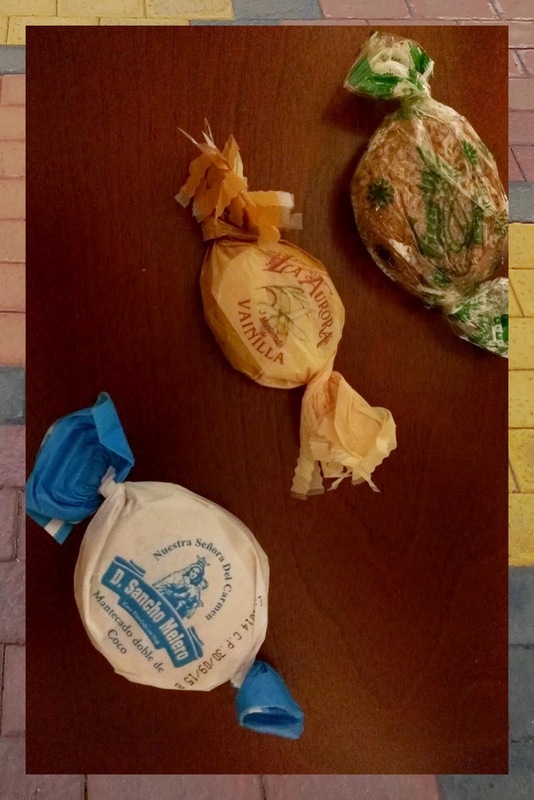 I definitely have a sweet tooth and was excited to find my favorite Spanish holiday specialty available in Lanzarote. Mantecados are pulverized almonds held together with either lard or olive oil. We were visiting Lanzarote in January and managed to nab a large bag of mantecados at rock bottom sale prices. I'll be rationing them until we plan our next trip to Spain! 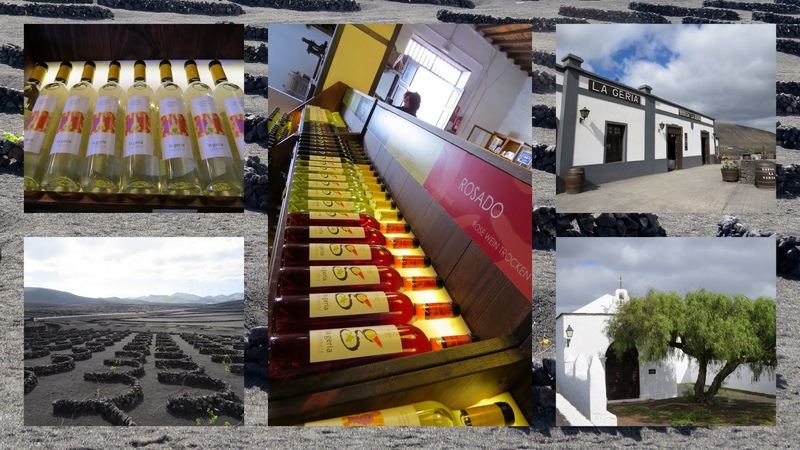 Discover top food and wine experiences on a trip to Lanzarote in the Canary Islands. Written by Dublin-based travel blogger Jennifer (aka Dr. J) from Sidewalk Safari.